If you have an insatiable appetite for active-wear, you may want to give Fabletics a try, and at take advantage of their first outfit for $25. You may then want to re-evaluate after giving their stock a proper evaluation to see if the rest of their offerings are worth $50 a month. The company's customer service is in dire need of a makeover. In the end, a business model that charges consumers for simply forgetting to log in does not seem to put the customer first. Fabletics is a subscription-based active-wear website co-founded by Kate Hudson which offers monthly outfits to members. A VIP membership costs $49.95 per month for one customized outfit. You can skip any month, provided you log in between the first and the fifth of the month. The commercial below is one of many Fabletics TV spots to hit the airwaves in 2015. The commercials feature a fit and stylish Kate Hudson modeling some of the available outfits, which has proven to be a successful marketing visual. Fabletics is a membership-based active-wear website co-founded by Kate Hudson. To sign up, you start by taking a quiz which helps the site better customize your monthly outfits. On the first of every month, a new outfit is suggested based on the preferences you set. If you log in between the 1st and 5th of the month, you can decide to approve your custom outfit – which will be $49.95 – or to skip the month. If you don’t log in, you’ll automatically be charged $49.95 which will appear as a credit that you can use toward any outfit on the site. The $49.95 price does not reflect the cost of every outfit, however, but that of your monthly suggestion. 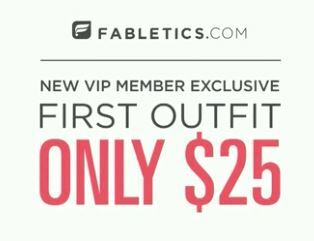 Currently, Fabletics is running a special in which you can get your first outfit for $25, then additional outfits every month would cost you $49.95. The value of the $25 is certainly a good deal based on the quality of the outfits. Whether or not the outfits would still be a good deal at double that price will be subjective to each consumer. Reviewers online have echoed our sentiment that the quality of the clothing is overall pretty good, although a few items seem sub-standard. The variety of designs is acceptable, and overall the styles are aesthetically pleasing. While there is nothing inherently wrong with a subscription-based model, the small 5-day window seems to work against those who forget to log in to either check their suggestion or cancel. Numerous comments can be found online by customers who did not like (or understand) the monthly subscription and 5-day window. Perhaps the biggest “con” with Fabletics is not related to the styles or workmanship of the clothing, but of customer service. Canceling, exchanging, or dealing with customer service seems to be the biggest complaint among those who report negative experiences with the company. If they can improve this area significantly, their overall rating will probably rise another star. Purchasing clothing online is always a double-edged sword. While it provides varieties and options you probably wouldn’t encounter at your local mall, it also opens up the possibility of not looking or fitting the way you may expect. If you have an insatiable appetite for active-wear, you may want to give Fabletics a try, and at take advantage of their first outfit for $25. You may then want to re-evaluate after giving their stock a proper evaluation to see if the rest of their offerings are worth $50 a month. The company’s customer service is in dire need of a makeover. Have you used Fabletics? Tell us your thoughts below.